I’ve been doing a little background reading for an article I want to write about single context archaeology (in addition to looking at textbooks to use for an Intro to Archaeology class) and so I picked up Martin Carver’s Archaeological Investigation in the hopes that it would provide a better overview of methodology than the standard “Archaeologists dig in square holes!” American textbook. Of course I learned from Renfrew and Bahn’s Archaeology: Theory, Methods, and Practice and while I’m loathe to stray from the classic, I don’t think that students really need to become little Cognitive Processualists. Early commercial archaeologists liked his approach: it implied that “everything” that was to be destroyed should be recorded. And it implied that it was to be dug and recorded with great precision: small scale, messy archaeology was next to useless. 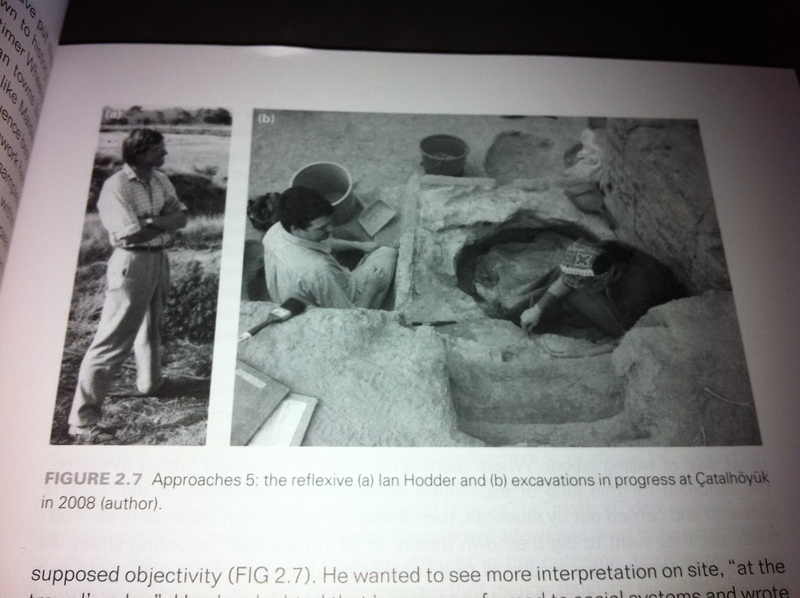 He set standards: archaeology must be very neat, immaculately clean, precisely defined and recorded in detail. Nothing else will do, and for those of us who learnt our trade in the late 20th century there can be no going back on this principle. Barker was an art teacher before he became an archaeologist, and his approach was to conjure a picture out of a sea of stony rubble by brushing and trowelling it – like a painter with a brush and a palette knife. So, that’s me on the right, digging “reflexively” in 2008 at Catalhoyuk. The plaster on the platform had been cut repeatedly to inter burials and then replastered again and I was trying to figure out which cut was associated with which plastering event. Man, what a headache. It’s a little strange to be used to illustrate a concept that I’m not sure I completely endorse. I appreciate some aspects of reflexive methodology, and certainly Catalhoyuk offered some of the best archaeology there is to dig…but…I guess this is why you write your own Introduction to Archaeology book, right? You did well; you have a head. I’m in Francis Pryor’s Seahenge with my head cut off… presumably because he didn’t know who I was. Though this was on a dig in North Germany. I missed you! and your stories . . . I thought it was because I didn’t shower for a week . . . you’re back we got a water delivery and its MAY 21, 2011 the world is still here and didn’t end.